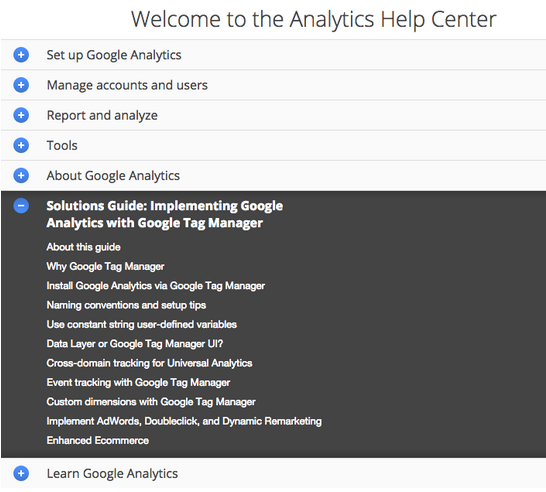 Today we’re excited to announce the launch of the Solutions Guide section on the Google Analytics and Google Tag Manager Help Centers. The Solutions Guide area is focused on providing actionable, hands on, step-by-step instructions for implementing Google Analytics, AdWords, DoubleClick, and other third party tags via Google Tag Manager. We’re thrilled to share this with you and hope you find it helpful as you implement Google Tag Manager. Check out the new GTM Solutions Guide today! Marketers, developers, and practitioners of analytics depend on having the right data at the right time - but implementing analytics code or AdWords pixels can be a less than fun (or easy) experience. Google Tag Manager makes tagging simple and fast by letting you add tags with a simple UI instead of code, while also offering advanced tracking features used by some of the web’s top sites.